Kitchen and Residential Design: Is it granite, gabbro or basalt? This is Absolute Black. It is always labeled and sold as granite but it isn't granite. It's a mineral called gabbro. When magma gets trapped in a single layer underneath the earth's crust, it will gradually cool and form gabbro. Now if the same material were to be pushed up from below under great pressure, it would form granite. But then again, if that magma were to come in contact with water it would turn instantly into basalt. Are you still following me here? Gabbro, granite and basalt are essentially the same material in different forms. In order to form granite, magma needs a good hard squeeze so its component materials can separate and form large crystals. If magma cools very quickly upon contact with air or water, it will form basalt. And if magma is left alone for a couple million years it will form gabbro. Why is this important? Well, it's important because those three phases of former magma have different properties. 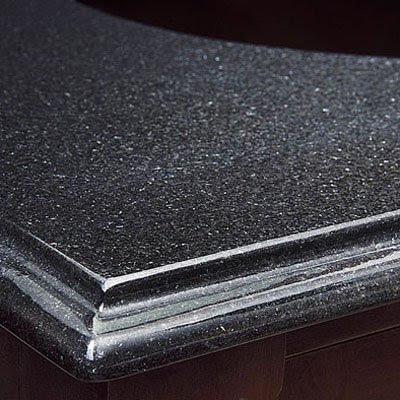 Basalt is the most brittle of the three which is why it doesn't get used as counter top material. Most granites are strong enough to be sliced into 3cm sheets without too much trouble. But gabbro, due to its uniform crystal size and density is stronger than granite. This means that it can handle longer, unsupported overhangs --like on a bar. 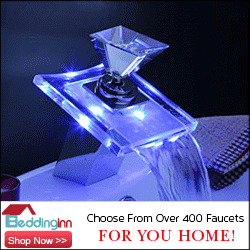 It can be carved into more ornate edge treatments and since it's so uniform, it is more water resistant. 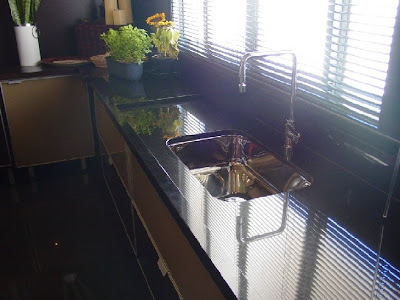 Absolute black is a great stone to make into a sink, whereas you wouldn't want to use most granites for that purpose. The downside to it (if it's truly a downside) is that it's always black or very nearly black. Chances are good that if you're looking at a uniformly black or very dark grey granite, you're not looking at a piece of granite at all, but rather a piece of gabbro. Now, due to that uniform crystal size and density, gabbro can be shined up to a mirror-like surface and that's where the problem with it is as it's ordinarily used comes in. It is impossible to keep clean if it's being used as a kitchen counter when it has that mirror finish. I have never heard of someone who had it and liked it. But the problem isn't the material, it's the finish. It will show every finger print, water spot, smear and smudge. It would drive me insane. Here's a slab of absolute black with a honed finish. The honed finish tones down the black quite a bit, and in so doing, it eliminates the mirror effect. 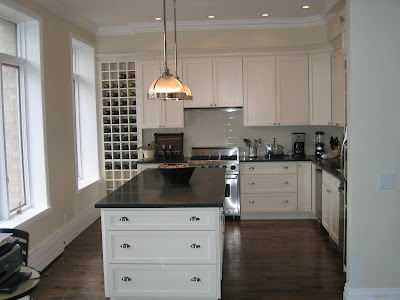 Here's a whole kitchen done in honed Absolute Black. 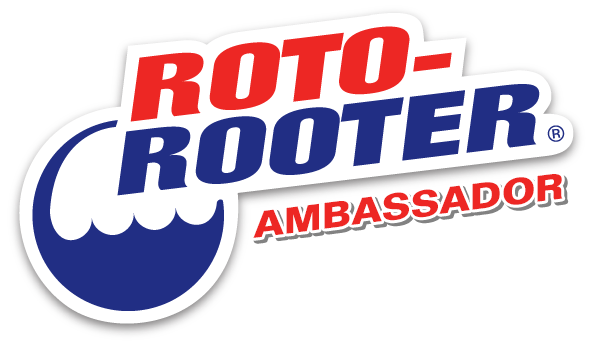 It's a much calmer counter than the shot at the top of this post, wouldn't you say? 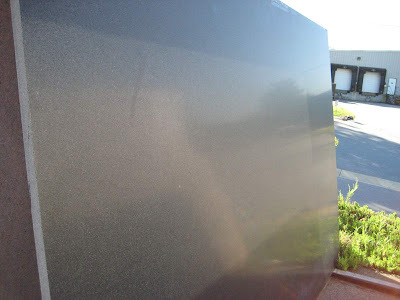 Now, because true Absolute Black "Granite" is a premium, a lot of less-than-honorable stone suppliers will take a less-expensive predominantly black granite and call it Absolute Black because most people can't tell the difference. 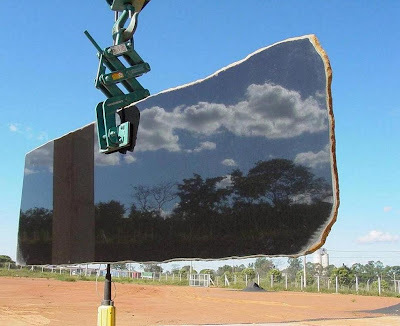 Sometimes; similar, dishonorable suppliers will actually dye inexpensive granite with black pigments and sell it as more expensive Absolute Black. Anyhow, if you're in the market for absolute black, make sure that what you're buying is just that. If it looks like this, it ain't absolute black. 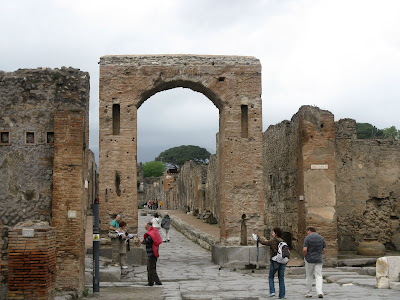 And as a completely unrelated yet completely cool side note, the paving stones on the streets of Pompeii are gabbro. Sometimes I just love geology. Even if the only person I fascinate with this stuff is me. You really did your homework this time Paul!!! I don't know where you get the energy from... I just added a kitchen to our gallery with granite called venetian gold (you may have a different name for it) I'm not sure if I can add this link to show you? http://www.woodaledesigns.ie/solidwoodpainteddublinviewer.html It's the granite on the first four pictures in the slideshow. We also added some white american oak countertops to give it some contrast. Great, great post. Perhaps this is why absolute black is the only 'granite' that I like - and now I know why - it isn't granite! (Disclaimer: my issue with granite is the busyness, I think it is a great countertop material). Keith and Holly: Thanks for your comments. I share your concerns about business Holly and wow Keith, I've never seen Venetian Gold look so good. That's a pretty easy to get granite in the US, but by pairing it with oak you gave it a whole new lease on life. Bravo! What? Now I have learned something. Very nicely put Paul! You're not the only geological geek around, so take some small cold crystallized comfort. Geology gives an interesting perspective to subsequent careers - I have a couple friends with that background, doing something very different nowadays, and it's funny how the subject will crop up and color a conversation in an unexpected manner. The unfortunate fact of dyeing stone to resemble another, more desirable variety has made that market tricky to navigate as a buyer. I, too, have heard that Absolute Black (or its impostor) is particularly prone to this. Caveat emptor. Came across your site while searching for an answer to figure out what kind of rock a friend's so-called "black granite" countertop really is. I'm confused by some of what you say, as it seems to conflict what I've learned in geology courses, namely that gabbro is the large-grained, slow-cooled equivalent of basalt, both of them dark-colored and high in iron and magnesium-based minerals, while granite is the slow-cooled, large-granied equivalent of *rhyolite*, both of them fairly light in color and high in feldspar and quartz. In other words, what I've learned is that granitic magma will become *rhyolite*, not basalt, if it flows out and cools quickly at the surface. Gabbro and basalt aren't the same thing and Rhyolite isn't granite. I am not a geologist and I defer to any geologists out there. What prompted this whole thing was when I found out that the Absolute Black sold as granite in the US and elsewhere is actually gabbro. Gabbro and basalt differ in that basalt, like rhyolite, is volcanic. As I understand it, gabbro and basalt are the same thing chemically but are categorized separately based on how they're formed. Does that help? Doug P is correct. I am a geologist and while I agree that most "granites" in countertop terms are nothing even close to granite, the original explanation offered here is not right. Granite and rhyolite do have the same composition chemically. They have very different textures because they form differently (slow cooling vs fast cooling). Similarly gabbro and basalt are also chemically the same. Just as Doug said. Then again, the vast majority of what's called granite isn't. Seems to me the term "granite" is used for all igneous rocks, for metamorphic rocks that contain quartz and/or feldspar (like gneiss or quartzite), and for sandstones that have a lot of quartz in them. I guess what these rocks have in common is a tight bonding of minerals and a composition that is similarly durable to granite.